Of all the artisan foods produced in Croatia, there are few so widely loved as pršut (PRR-shoot). If you’re familiar with the prosciutto of Italy and jamon of Spain, you’ll almost know what to expect. True pršut begins with a fresh pork leg that’s cured in pure Adriatic seawater, then pressed between large stones to remove the brine. Next the ham is smoked and hung outside to dry in the blasting Bura winds over winter. Pršut is typically then aged for anywhere from one to three years in dark cellars or attics, where its flavors mellow and mature. 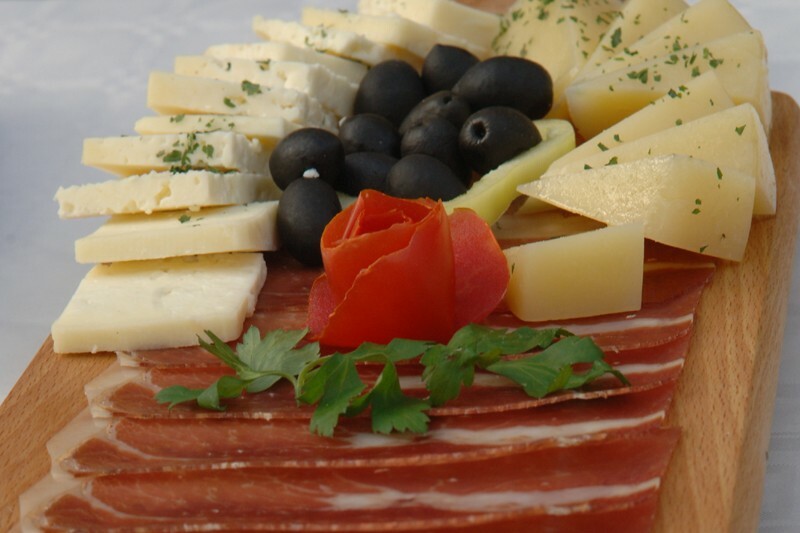 This traditional artisan food is typical to the Mediterranean coastal regions of Croatia, Dalmatia and Istria. This dry ham is a distinctive experience in flavor, texture and aroma not found elsewhere, an unmatchable product of breeding, diet and microclimate. Though passable, commercially produced pršut is available for purchase in supermarkets, many families make their own. Once you’ve tasted true pršut, homemade with the time and love it requires, you’ll understand why. Rakija (RAH-kee-yah) is the catch-all term for any kind of spirit distilled from fruit in Croatia, and it pretty much translates to ‘brandy’. Just as there’s apple brandy, plum brandy, berry brandy and so on, varieties distilled from different source materials take more specific names. In Dalmatia, the king of all brandies is travarica (TRA-va-ree-tsa), a sophisticated spirit that’s a superb digestive tonic. It is quite simply an infusion of pure grape brandy and a variety of herbs, and there are as many recipes for travarica as there are people producing it. Some varieties contain as few as ten herbs, while others can contain twenty or more. Plant materials typically added to the brandy include rosemary, chamomile, lavender, rose hips, matgrass, juniper, thyme, currants, mint and sage, but the list of possible additions is practically endless. Pure grape brandy isn’t widely available throughout the world, but if you have access to good grappa, making your own travarica is not a complicated undertaking. Insert the whole, edible herbs, flowers and dried berries of your choosing into a clean, empty bottle, then fill the bottle with brandy or grappa and allow to infuse for at least a month. The longer you allow the alcohol to absorb the essential oils and aromatic components of the plant material, the stronger and more complex the flavor will be. Fig trees are tremendously abundant in Dalmatia, growing wild just about everywhere. When the fruit ripens and begins dropping from its branches in September, you’ll find – and inadvertently step on – plump, sweet figs in the narrow lanes and paths of the villages where they grow. They are collected and laid out on rooftops to dry in the late summer sun, and eaten throughout the year. Smokvenjak, a delicious aromatic cake, is prepared from dried figs, wrapped in fresh bay leaves and “baked” in the sun, then stored and dried for as long as two months before serving. Though it originated on the isle of Vis (where it is known as hib), smokvenjak is popular throughout Dalmatia, and enjoyed with brandy or coffee.